A good crowd, lots of smiling faces and healthy debate over a host of hot-button issues comprised the effective beginning of Equestricon, the first ever national horse racing convention, Monday in Saratoga Springs. Though Equestricon hosted a number of events around town and at the racetrack Sunday, Monday morning was the opening bell of a jam-packed two days hosted at the Saratoga Springs City Center. There were panels, seminars, giveaways and dozens of booths ranging from industry stalwarts to upstarts. Topics covered in panel discussions ran the gamut from Thoroughbred aftercare to handicapping tournaments. This is a slice of my experience at this decidedly new venture in horse racing networking and promotion. The first thing you notice when you walk in the door is how well-staffed Equestricon is. There are employees everywhere you turn with “Ask Me Anything” shirts directing guests to the meeting room or booth of their desire. Everything was organized smartly and the venue, which I had never been to in over a decade coming to Saratoga, was big and modern. Optimism permeated throughout the main hall of the convention, with cheery representatives ready to talk horse racing in every capacity. 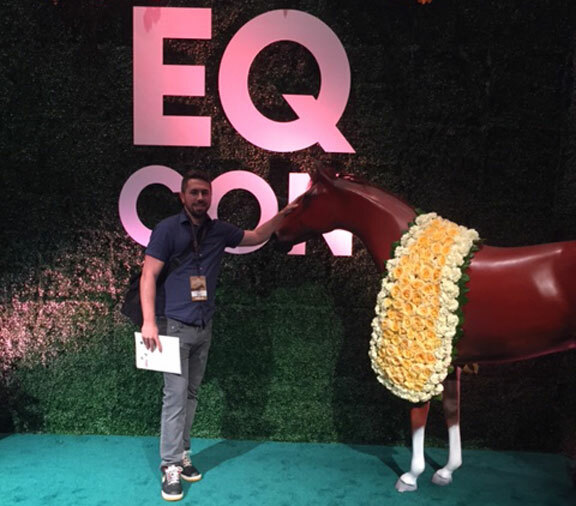 While there was a feeling-out process as to the direction of the event with so many disparate interests side-by-side, everyone I spoke to saw Equestricon as a net positive, and most importantly, an innovative idea that could beget other innovation in a sport sorely needing it. The most engrossing part of my day was the Coast-to-Coast Marketing Panel, sponsored by this very publication. A group of five racetrack representatives broke down what they were doing to grow racing as a business in their jurisdiction, followed by a lively question-and-answer session that often challenged those representatives. A myriad of viewpoints and strategies for bringing new fans to the track were discussed, and Equestricon did a good job to put officials from greatly varying size of operation in the mix, as NYRA’s Director of Marketing Darran Miner sat alongside Remington Park racing analyst and handicapper Kathy O’Hara. Miner talked up NYRA’s “digital transformation” in the last few years, saying that the organization’s database of fans has gone from 60 to 70,000 to over 220,000 names, which has let them better sell tickets and communicate with fans. He also noted that NYRA’s Facebook, Twitter and Instagram followings have more than doubled, and that their choice to market “big event” days like the six-Grade I Belmont Stakes Day has increased turnout in younger demographics. O’Hara, a former jockey whose career was cut short by injuries, discussed the challenges of running a racetrack in Oklahoma City, where there are over 100 casinos within the state and more than 15,000 slot machines in the city. She also touched on the challenges of keeping up with an increasingly modern city when the talk turned to upgrading racetrack facilities. C.J. Johnsen, the director of broadcasting and wagering at Kentucky Downs, also brought a unique viewpoint–that of a track running five days a year trying to stand out in an overcrowded racing calendar. Johnsen spearheaded a marked takeout decrease in 2015 and the results have been overwhelmingly positive, with handle at the Franklin oval jumping in each of the last two years. Kentucky Downs has also drastically improved its presentation, with high-definition broadcasts and additional angles added to displaying races over the quirky, European-style turf course. Innovation has always been a strong suit of Keeneland, and Director of Marketing Christa Marrillia talked about how their technological advances and “Betologists” at the track have improved business, while Arlington’s Director of Marketing Alyssa Ali impressed as well, noting among other initiatives the track’s engagement with the larger sports-crazy community of Chicago. Things got interesting when Christian Hellmers of the Horseplayers reality television show asked a question about what tracks have done to market not just the handicapping aspect of racing, but the gamblers themselves. He posited that the sport had done a lousy job of celebrating the winners at the racetrack and making apparent how much money can be made playing a cerebral game like the horses, thus costing themselves a chance at the sophisticated, analytical, player who may have put those talents into something like Wall Street. O’Hara added that Remington will be producing a cable television show in 2018 that does follow some of the biggest bettors and personalities in Oklahoma horse racing. Johnsen said baby steps were generally the way to go with new players, and Miner concurred, noting that even the terminology of betting horses can be intimidating for newcomers. 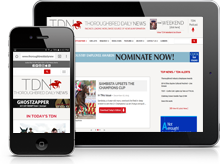 Perspectives: Social Media in Horse Racing sponsored by the Maryland Horse Breeders’ Association and Jim McKay Maryland Million Day was also a fascinating discussion, one of a rapidly-changing landscape in horse racing’s growing online footprint. This crowd was not as big as the one for the marketing panel, but skewed much younger and had power players in racing media like Pat Cummings and Nick Luck, who will be giving Tuesday’s keynote speech, in attendance and asking questions. The half-dozen speakers on this panel, all directors of social media in one form or another, had interesting things to say and a wealth of knowledge and experience despite all being decidedly young. All of them agreed that horse racing was a natural linkup with social media, especially on platforms like Instagram, being such a visually arresting sport. They also all found gratitude in their work of bringing the behind-the-scenes experience of horse racing to thousands of people who don’t necessarily have those connections. Susie Raisher, who runs social media for Centennial Farm and used to have the same position at NYRA, talked about how important community-building through social media has always been in racing, going back to the AOL message boards. As a former ESPN racing message board goer, I nodded in agreement. Cummings asked a pointed question about racing’s obsession with television ratings and how that is at odds with the trend toward livestreaming. The panelists all said that broadcasting contracts have gotten in the way of their ability to livestream content, whether internationally or locally. If day one was an indication, day two of Equestricon is going to bring more thought-provoking debates on the future of racing, both big picture and small. These discussions need to be had in public with a lot of perspectives having input. So far, so good.